Sales of desktop 3D printers, the majority of which are still purchased by companies and schools, skyrocketed last year to the tune of a 69.7 per cent increase. 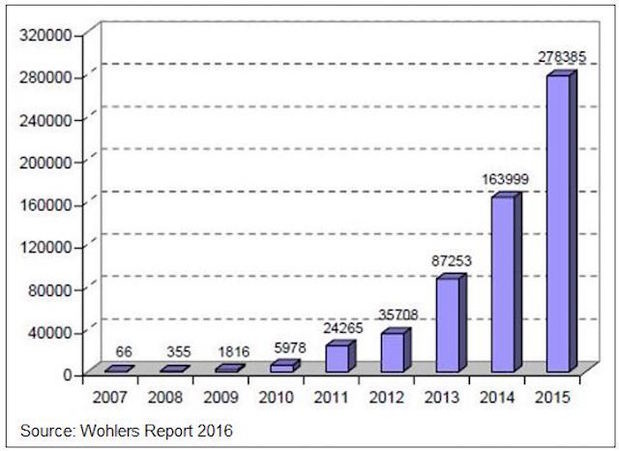 From 2014 to 2015, the sale of desktop printers with a retail price below $US5000 jumped from 163,999 to 278,385, according to the 21st edition of the Wohlers Report. Terry Wohlers, president of industry research firm Wohlers Associates, said desktop sales are booming because they're inexpensive, "yet many of them produce decent models for early concept modeling of new designs. "It's similar to when AutoCAD was introduced in the early 1980s," he said. "It could not do everything the expensive CAD software could do, but it did enough, so the value was good. The same was true with the early PCs compared to the more expensive UNIX workstations and mini computers from DEC and others." As a whole, the additive manufacturing (3D printing) industry, grew 25.9 per cent last year to $US5.1 billion in sales or services, the report states. The compound annual growth rate (CAGR) over the previous three years was 33.8 per cent; over the past 27 years, the CAGR for the industry was 26.2 per cent. Worldwide revenues from the additive manufacturing and 3D printing industry is expected to reach $US12.8 billion by 2018, according to Wohlers Associates. By 2020, Wohlers forecasts revenues from all products and services in the 3D printer industry to exceed $21 billion. Desktop 3D printers with a retail price of under $5000 have exploded over the past few years. The Wohler's Report is the result of an annual study that includes data on 51 industrial system manufacturers, 98 service providers, 15 third-party material producers and numerous manufacturers of low-cost desktop 3D printers. In 2015, 62 manufacturers sold industrial-grade additive manufacturing systems that were valued at more than $US5000, compared to 49 in 2014. That's twice as many as the 31 companies that sold industrial systems in 2011. "The industry is transitioning from a prototyping past to a production future," said Tim Caffrey, a senior consultant at Wohlers Associates and a principal author of the report. "Opportunities for [additive manufacturing] in production applications are orders of magnitude greater than for modeling and prototyping. The money is in manufacturing, not prototyping."